Over the centuries various legends about the life of Augustine have arisen and have received much attention. This happened in many previous centuries when the word “history” was more taken to mean “that which has been heard about the past” rather than to be “that which factually happened in the past.” It so happens that the English word history comes from the same source as the Italian word storia – close to the English word, "story." These legends relate to numerous parts of Augustine’s life. One of them concerns a supposed meeting by chance of Augustine and a child at the sea shore. This legend was well-known in the Middle Ages, but has no grounding in anything that Augustine himself wrote or preached. The scene is the seashore, where there is a small pool, a little boy with a seashell, and a sandy beach on which St. Augustine, clad in his religious robes, is walking, pondering with difficulty the mystery of the Most Holy Trinity. “Father, Son, Holy Spirit; three in one!” he muttered, shaking his head. As he approached the little boy who was running back and forth between the sea and the pool with a seashell of water, Augustine craned his neck and asked him: “Son, what are you doing?” “Can’t you see?” said the boy. “I’m emptying the sea into this pool!” “Son, you can’t do that!” Augustine countered. “I will sooner empty the sea into this pool than you will manage to get the mystery of the Most Holy Trinity into your head!” Upon saying that, the boy, who was an angel according to legend, quickly disappeared, leaving Augustine alone with the mystery of the Most Holy Trinity. In a gorgeous 15th century book of saints’ lives by Jacobus de Voragine, called Legenda Aurea or The Golden Legend, this amazing story about St Augustine and the child at the sea shore is found (in a different translation to the one above). 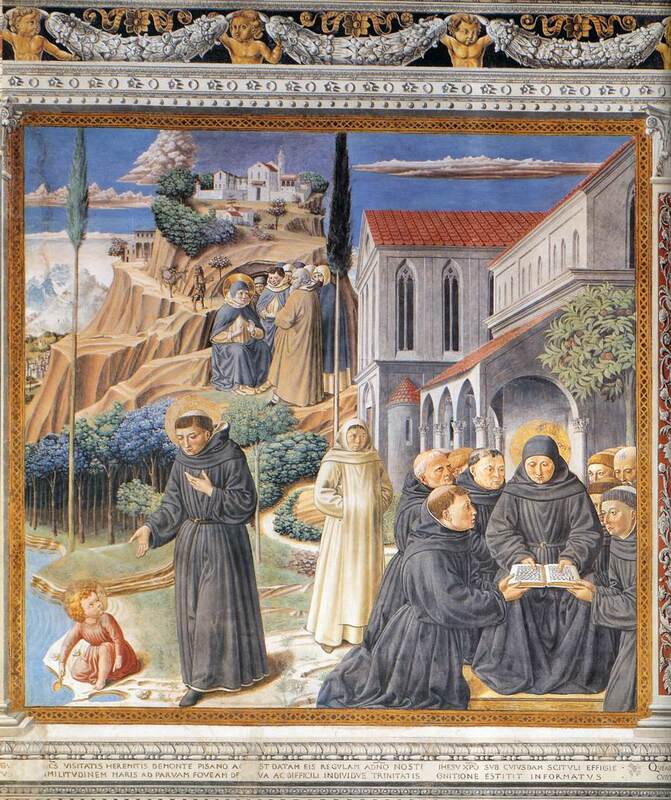 This legend, and another one about Augustine’s living in a hermitage at Tuscany, were both portrayed in one of the frescoes produced by Benozzo Gozzoli during the years 1464-1465 in the Church of Saint Augustine at San Gimignano, Italy. Part of this fresco, called The Parable of the Holy Trinity, is included here at the right. The same legend was painted life-size in a fresco at the Augustinian Eremo di Lecceto in the year 1712, but is now almost effaced. It has been abundantly depicted by artists during the past four centuries. One such painting was done by François de Nomé early in the seventeenth century. It now hangs in the National Gallery, London. Augustine and child at seashore. One particular painting is part of the outside murals in the Augustinian monastery of Quito, Ecuador. It was done by Miguel de Santiago in 1656.